After bouncing from foster home to foster home, Magdalene Mae is transferred to what should be her last foster home in the tiny town of Silver City, New Mexico. Now that she's eighteen and has only a year left in high school, she's determined to stay out of trouble and just be normal. Agreeing to go to the prom with Bridger O'Connell is a good first step. Fitting in has never been her strong suit, but it's not for the reasons most people would expect-it all has to do with the deep secret that she is a shape shifter. But even in her new home danger lurks, waiting in the shadows to pounce. They are the Skinwalkers of Navajo legend, who have traded their souls to become the animal whose skin they wear-and Maggie is their next target. Full of romance, mysticism, and intrigue, this dark take on Navajo legend will haunt readers to the final page. I’m quite shocked at how much I enjoyed Shifting. After attempting to read numerous books and failing to really get into any of them, I picked up Shifting and expected to put it back down, just like all the others. But I couldn’t, because from the first chapter, I was drawn in. I loved the characters. Maggie was interesting, although a bit too forgiving, and Bridger was engaging, if a bit arrogant. But flawed characters are believable characters. Their relationship had me on the edge of my seat from beginning to end, and the ending was…..expectedly unexpected. I saw some sort of twist coming but I kept changing my mind about what exactly that twist may have been. I like that it kept me guessing. This isn’t the cover that is on the ARC I read, and I’m hoping the cover on the ARC is the official. (Although I’m pretty sure THIS is the official cover) It makes a lot more sense to me than the snake does. Don’t get me wrong, I love this cover, but the ARC cover seems more appropriate. 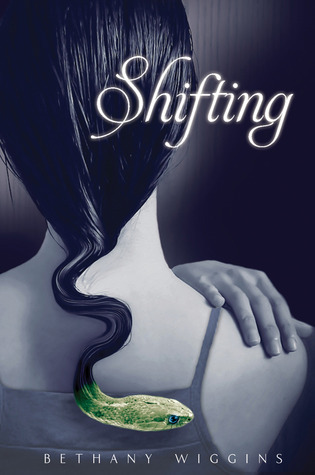 Shifting is one of those—dare I say—Twilighty, feel good books. (I am not going to elaborate, or say which I prefer…heh) There’s a touch of paranormal, and a romance that you can’t help but see through to the end. And in the end, you just think “aww”. To my knowledge, there is no sequel in the works, which is okay because this book came to a satisfying conclusion. I would not, however, be the least bit upset to see more of Maggie and Bridger in the future. Thank you so much! I'm glad you liked it (and you totally made my day). The creepyish cover caught my eye. Think the snake is fitting though as the book has to do with shape-shifting. The book also sounds like an interesting read. Ooh, now I'm even more excited to get this book! Thanks, Amanda, for the insightful review. And congrats to Bethany on a glowing early review!! Love the Indian legend ing the story. Very cool. What a great review! Makes me want to read it. I enjoyed your review, Shifting sounds like a wonderful story. I think the cover is great, I wish I could see the ARC cover though. This looks really good! I'm actually looking for some books that don'thave a sequel. Sometimes it's nice to read something that doesnt require a 3-4 book commitment. Goodness, this looks very good and I do love this cover!! I will put this on my TBR list. The cover caught my eye! After reading the summary, it doesn't seem like my kind of book. But for some reason, the cover had me interested.